Today Brian and I celebrated our wedding anniversary. Last night, in preparation for the surprise I wanted to give him, I went “driving” on Google maps. The reason being is I couldn’t remember the name of the Alpine Lodge-like restaurant that Brian always says he wants to visit when we pass by it on the freeway. I had a vague memory of it being after the 22 freeway and before the 605, so I got my map set to the 5 freeway just after the 22 and moved the little “man” icon to street level. I admit, it was challenging because sometimes the map would jump me to an off ramp and I would find myself lost…then I would have to start over again. I also questioned my memory of which freeway it was off of, and perused the 405 for about 20 minutes…excessive, I know! Even as I was considering my method to be madness, I continued on. After all, I convinced myself it was for an anniversary and so the extra pains to find my destination would be worth it. Well I am happy to say I finally found the faux, snow covered alpine and thanks to the camera work of Google, and its 360 degree panning option, I found the name. 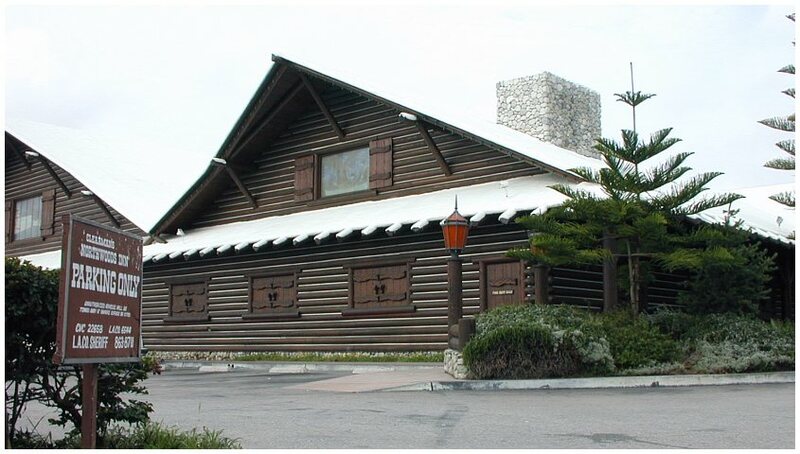 Clearman’s North Woods Inn, La Mirada California. With the name in my possession I was able to check on its hours of operation, and even check its status on “Yelp”. Let me offer a bit of advice…when you are planning something for a loved one, and are considering their interests, tastes, or desires, skip out on reading reviews and looking at pictures and reading the menu with prices. Because even though I had found my prize, I also found my prize was an over priced dump which serves the type of food that, yes, Brian would love, but I would be compelled to picket due to the high amounts of injurious food and portions. Which is why before I shut my accomplice down for the night (my computer), I avowed to not only surprise Brian with a lunch at the 1950’s should-be-thrown-back chalet, but to pretend I shared the same enjoyment with the entire experience as well…gloppy cheese bread, mayonnaise salad, and all. And with my resolve, a good feeling fell upon me. It does feel nice to have my “self” sit on the bench and let Brian take the play…it just took some coaching to get me-self agreeable to the idea! Well today my lovely daughter asked us where we were headed for our lunch date. I told her, her father didn’t know and it was a surprise–but it is about a half hour away from our home. Upon hearing my words, Brian said, “I know where we’re going! Is it to the snow?” “WHAT?”, I questioned, “how did you know?” Turns out that after 20+ years together, Brian and I are one…go figure. I often know his thoughts, he often knows mine; even my hidden and surprise thoughts. And lucky for me, he did know because he told me he wasn’t really feeling for driving as far as we would have to drive to get there. HIP HIP HOORAY!!! “No skin off of my nose”, I said, “I am happy to withdrawal the plan and redirect!” Now that is what I call “grace”. And off we went to Laguna Beach to one of our favorite and quaint little restaurants. And being I didn’t have to swallow down bread dipped in grease, or potatoes lathered with “cheese butter” (which actually sounds intriguing in all the wrong ways), I enjoyed dessert because I could. Then, as is customary for me after eating a meal out, I retrieved my little lipstick holder from my purse to refresh my, dried out and pale, lips. And to my wonderful surprise, thanks to my ever conniving children, I found my little “King’s cake” baby lying in my lipstick holder. I called them and they said, “you got Baby-D!”, and they laughed and laughed, as did Brian and I. Since the oven is still on the fritz, the baby keeps “popping” up in the most notorious of locations. In fact, he’s awaiting the next victim as we speak…I can’t wait to see who it will be! Cole’s VA 100% service-connected rating coming in the mail on the very day our health insurance benefits ended–the same day of my grandmother’s passing, such good news on one heck of a hard day; more grace. Not having to drive, eat, nor lounge anywhere near the Clearman’s North Woods Inn; grace, grace, grace! Truly the Lord’s grace is washing over my weary soul…thank you Jesus! I have to say that we have been intrigued by the snow covered chateau as well. I used to want to stop there…you cured me of that. I will still admire it when I drive by everytime I come to visit you. Happy Anniversary! Happy Anniversary to two of the most loving and giving people I know. Love you both. You say the nicest things! Thank you. P.s. When I originally wrote this post, last night, I put that the kids said I got “Kinged”. But this morning I was corrected…I actually got “Baby-D”, so I changed it this morning to stay true to the facts. Shhhhh…don’t tell Cole, the little king is awaiting his PB&J in the Smucker’s jar of jam! Thanks for the story Rivka!